The town government of Wellesley is currently creating a housing production plan that would stave off 40B housing proposals, which are for affordable housing developments. Three 40B plans are currently being proposed by developers. Residents of Wellesley are worried that the current housing proposals are profit-motivated and will take advantage of the town rather than integrating affordable housing into the town or making these developments actually livable. Chapter 40B is a state statute, which, since the 1970s, has enabled local Zoning Boards of Appeals (ZBA) to approve affordable housing developments under flexible rules (Comprehensive Permit) if at least 20-25 percent of the units are permanently income-restricted. This statute exists to help towns to achieve the mandate that Massachusetts towns reach a point at which at least 10 percent of housing in the town is affordable, according to calculations by the state based on median income. To reach this marker, state or federal housing programs can approve development plans which would allot at least 25 percent of new housing as affordable. If a town, such as Wellesley, has not met its required 10 percent of affordable housing, it is then open to 40B proposals, which residents consider unfriendly, according to spokesperson from Our Affordable Wellesley, Pete Buhler. Our Affordable Wellesley is a community group that aims to “Stop Affordable Housing Abuse,” according to its Facebook page. Its website asks residents to “Please join our efforts to help the town achieve safe harbor so we can start building housing solutions that respect the community and its future residents.” The group formed in 2017 as a direct response to a local 40B proposal. As an alternative to reaching the requirement through external developers’ proposals, like the ones currently under review, towns can create a housing production plan that details how they will eventually reach the requirement. If this plan is approved, Wellesley will achieve what Buhler called “safe harbor”–it will have the power to turn down what it deems unfriendly 40B proposals from developers. In Wellesley, one of the wealthiest zip codes in the state, affordable housing proposals have been met with opposition, both from those who believe that 40B developers are only in it for money and won’t ultimately help people and from those who would simply rather not have poor people in their town. In Wellesley Facebook groups such as “What’s up, Wellesley?,” posts about 40B housing are often met with despairing comments about how this will send the town into a downward spiral. 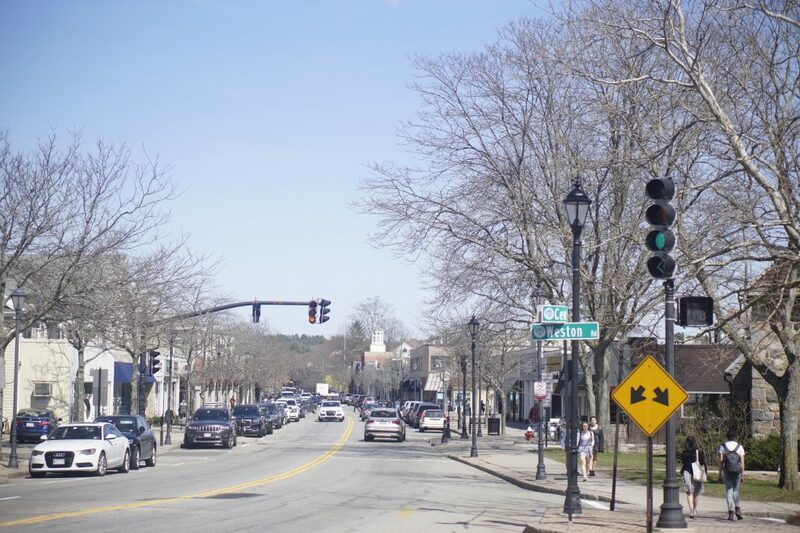 Wellesley, like other Massachusetts municipalities, is mandated by law to reach a 10 percent affordable housing threshold, which means that some new housing needs to be developed, since the town is currently only at 6 percent. The question, now, is exactly what that development, completed under the Chapter 40B state law, will look like. “Currently, we’ve got three projects in front of us that are seeking that first eligibility letter. There are two that are closely related by the same developer on Route 9 [near Wellesley, off Weston Road] and then there’s a separate project further down Route 9 that is on hold right now, because the town is considering taking it by eminent domain,” said Paul McMorrow, a spokesperson for MassHousing, one of the groups that can approve 40B developments. The other two groups that can provide approval are Massachusetts Development and Mass. Housing and Community Development. McMorrow does not know if those two groups are also working on this project. “Those three are live right now, and in the past, since Jan. and Feb., we gave an eligibility for two other ones, and so those developers are now able to proceed to the local level. I do not have an update on when and whether they plan to take that step,” he said. Buhler told The Wellesley News that his group is also concerned about the increased traffic that these proposals could cause, which may affect Wellesley College. “I really do worry that the proposals that were at Delanson Circle and 148 Weston Road would be traffic nightmares; one of those is right at the corner of Weston Road and Linden Street, and that goes right over the bridge towards where the college is and that just seems like a traffic nightmare,” Buhler said. “40B, generally, is a market-driven program. Most 40B projects do not have significant state subsidy in them, they are internally subsidized. And the strength of the market-rate rent or sales create the subsidy within the project that allow the affordable units to be economically viable. And so, some communities haven’t reached 10 percent, because there isn’t a strong enough development market to create those subsidies,” McMorrow said. Some townspeople are invested in the outcome of the 40B issue because they see it as connected to the well-being of the school district. Another member of Our Affordable Wellesley, Lisa Fico, said that she started looking into 40B housing because she’s worried about potential school closings in her community and wanted to learn how more about how affordable housing might prevent that from happening. There are currently seven Wellesley elementary schools, and due to declining enrollment, the district is proposing closing one. However, Fico said it is unclear which school will be closed. “I think the proposal to close a school is a little shortsighted, without thinking about what’s going to happen with those 40Bs,” Fico said. More 40B housing in the town, she pointed out, might mean a significant increase in the number of families with kids living here. The town will need to add “approximately 400 units” to get up to 10 percent, which Fico said could mean 100 to 250 kids that will need schools. McMorrow said that even getting to the 10 percent threshold won’t, ultimately, meet the demand for affordable housing in the region. However, he said it’s a step in the right direction. “We know that the need for affordable housing among low to moderate income folks is great across the region. … And we know that even getting to 10 percent in and of itself is not enough to meet the need for housing growth, generally, and it’s not enough to support the need for affordable housing. So we want to do as much as we can to help communities to meet that need,” he explained.